So, you think you're a stat master? Well, are you up for a challenge? Topps has an innovative new product for those thrill seeking collectors who love the heat of competition - TOPPS PACK WARS. Whether you've played at your local hobby shop, in a stadium or at a Topps sponsored event, one thing is for sure - PACK WARS is reason for excitement. 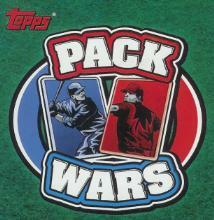 The all-new Topps Pack Wars - Head to Head is all the fun of the popular hobby game wrapped into one package. *Two collectors together purchase one pack of TOPPS PACK WARS ($20 SRP) at their local hobby shop. -2 Game Packs (3 cards in each pack for 3 rounds of play). There is one pack for each player. *Then they play an easily understandable stats game and the best of 3 games takes the prize pack! 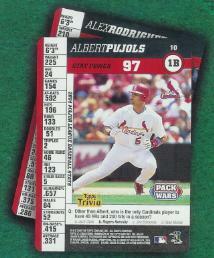 And for the player cards, there are 175 total subjects. The base set also includes a foil parallel (#'d to 125). As a bonus, each box includes another Topps Innovation - an MLB Collector Chip. Stay tuned for details regarding in-store Pack Wars competitions and tournaments. Topps Pack Wars hits the hobby February 14th.